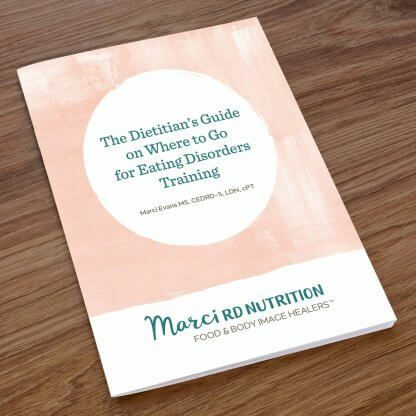 The Dietitian's Guide on Where to Go for Eating Disorders Training - Marci R.D. With nearly 10% of the U.S. population falls along the eating disorder/disordered eating spectrum, the likelihood of you, as a clinician, bumping into someone with an eating disorder is quite high. Being prepared to work with these clients is essential, no matter if you are not even certain you want to work with eating disorders clients. Working with this population does require specialized training and should NOT be taken lightly. This means that having a basic knowledge of what eating disorders are all about and the resources available to you for gaining more knowledge, is extremely important. Finding the training that can help you accomplish this and develop the skills needed is essential. And that question above, is exactly why I wrote this guide, The Dietitian’s Guide on Where to Go for Eating Disorders Training. I want clinicians far and wide to know about the multitude of resources available to help them feel less anxious and more excited about the complex world of eating disorder care.